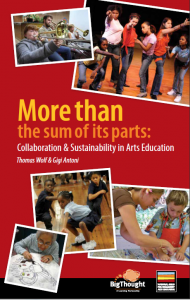 Written by two seasoned practitioners—Thomas Wolf and Gigi Antoni—this new book is a primer on how organizations that offer arts education and creative learning programs can initiate, enter into, and support long-lasting partnerships. The complete book, which is jointly published by WolfBrown, the National Guild for Community Arts Education and Big Thought, is available as a free download. Printed copies may be purchased from Amazon.com.